Join us on Monday 26th March for special guest speaker Mark Wrack. 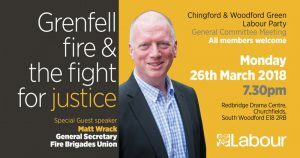 Matt Wrack, the General Secretary of the Fire Brigades Union has been a tireless campaigner in the fight for justice for those who have died and those left homeless. The Grenfell Tower fire broke out on 14 June 2017 at the 24-storey Grenfell Tower block in North Kensington. Tragically it caused 71 deaths. More than 250 London Fire Brigade firefighters and 70 fire engines were involved from stations all across London in efforts to control the fire. This fire has laid bare many of the lies about social housing today, outsourcing and the drive for profits have put social housing tenants lives on the line in the name of a discredited market ideology. “I feel very angry that it was possible for the fire to spread in the way it did. I feel very angry that so many have lives have been lost when the system didn’t work. “The many residents I met today are very angry too; their concerns about the building were not responded to and their questions were not answered. “I would like to give thanks to the firefighters who risked their lives to save the lives of others, and the police and the paramedics who did the same. “Some hard questions need to be answered. It cannot be right that in the 21st century a fire like this happens. “It’s the responsibility of Government to tell us why the lessons of Camberwell, Southampton and Shepherds Bush have not been learned.